This past year our quilt guild did what has become known as the Denyse Schmidt paper bag challenge. For this challenge, you draw a solid and a print fabric from a bag (no peeking) and the challenge is to make something using those two fabrics. You can add any other solids in the same color line as the solid you drew, and a neutral (white, cream, grey, black). But no other colors and no other prints. 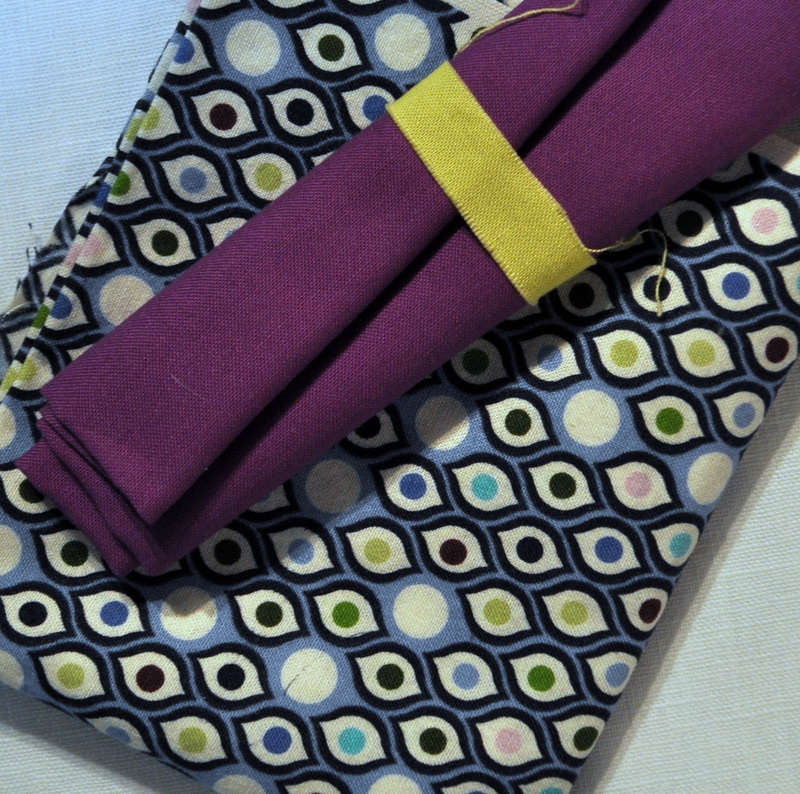 These are the two fabrics that I picked. Our reveal was last fall sometime, but I finished mine just this week. Hey, better late than never! I had also been working on designing a pattern, so I decided to use it for this challenge. I think it turned out really good, but I think the butterflies would have looked much more dramatic on a plain white background. It’s hard to tell from the picture, but all the butterflies are a form of purple. It finishes at 45″ x 45″. 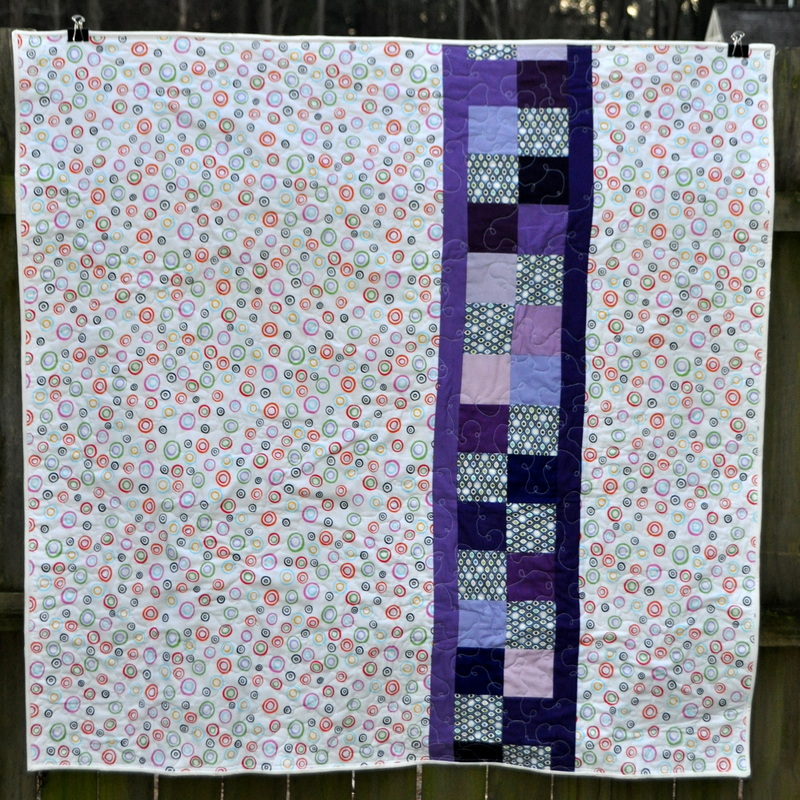 This is also the first quilt I quilted on my home machine since I used the long arm that I talked about here. And, honestly, I hated every minute of it. Just once on the long arm, and I am so spoiled now! I also finished my name tag for wearing to guild meetings. My son drew it for me, and I digitized and embroidered it. It was my honeyman’s idea to put the bamboo frame around it. So I sent him and his friend on a scavenger hunt to the country club neighborhood down the road to find me a few branches. I thought I had seen some when I was out walking one day. It wasn’t the easiest thing to make, but it certainly gives it some personality. I guess you could say that making this name tag was a family affair. This entry was posted in Quilting/Sewing and tagged bamboo, butterfly, challenge, Denyse Schmidt, float, fly, fly away, long arm, monkey, paper bag, quilt, quilting, scavenger hunt, soar by monkeyneedle. Bookmark the permalink. The name tag is just precious. More so because it was a family affair. How cool is this!!! I love your vision and the colors are perfect. Great job on this challenge!!! Thanks Ashley for being such a great supporter! You always leave such sweet comments. I love your butterfly quilt! And your name tag is really cute!! You clearly have a very fun imagination! This is such PRETTY quilt!!! 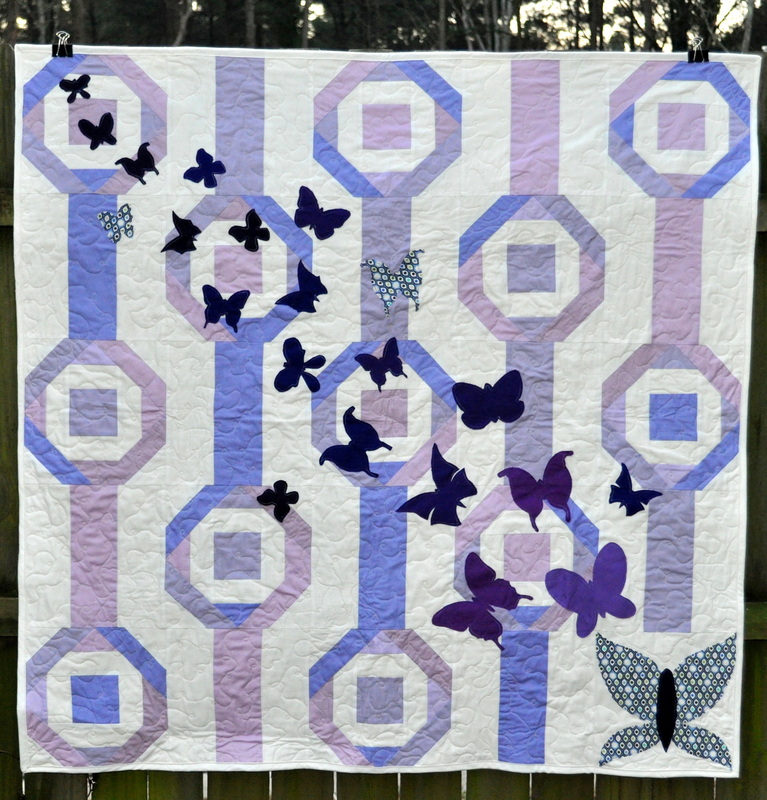 lovely quilt, very striking with the butterflies at a diagonal. Thanks Micki! Sometimes, I wish I could fly away like those butterflies. Very cool, very creative! Well done! 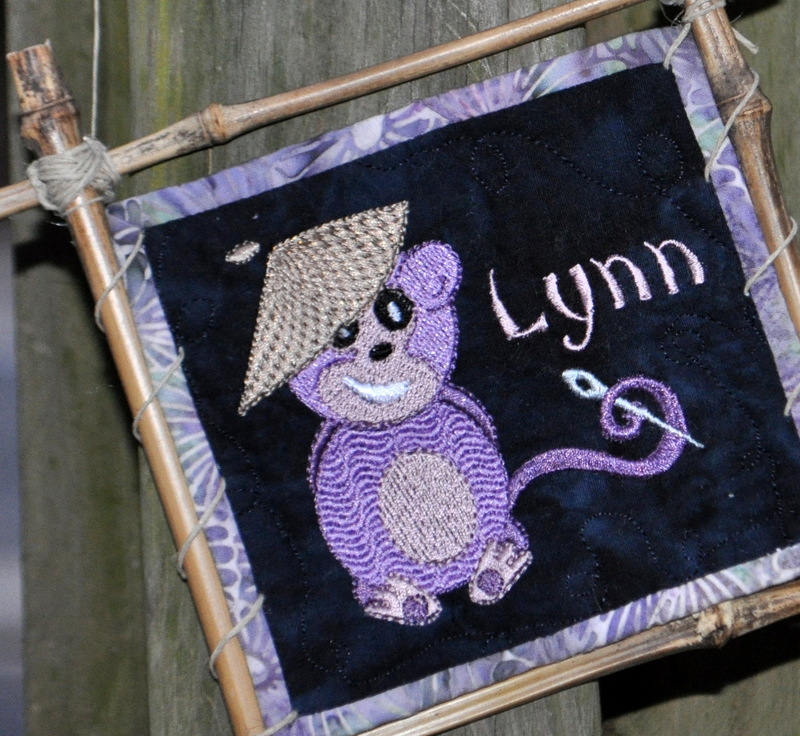 Nice job on the quilt, Lynn! It’s a great fit for the Pantone challenge! Your butterfly quilt is stunning. I love the purple, love the pattern and really love the butterflies. Great stuff.